Thousands of UK consumers have been voting for their favourite bank accounts, credit cards and more as part of the British Bank Awards 2017. Now in its third year, the British Bank Awards aims to give consumers a voice - the winners are determined by customers votes, and to help millions of UK customers to find the very best financial services providers on the market. For an incredible third year in a row, Leeds-based first direct once again dominates the awards, winning 5 in total including Best British Bank with a customer satisfaction rating of 95%. As well as being named “Best Current Account Provider” for their popular 1st Account, they also take home three of our top-level awards: “Best Customer Service”, “Best Value for Money”, and “Most Recommended Bank”. Nationwide remain first direct’s strongest competitor, holding the runner-up spot in our customer satisfaction league table for a second year. Other multiple winners were Virgin Money and Zopa, both scooping two British Bank Awards each. Virgin Money win “Best Newcomer”, making an impressive new entry to our banking league table in second position. They also won the coveted “Best Credit Card Provider”, won last year by Barclaycard. Bill Percy, Customer Experience Director at Virgin Money, said: "Delivering great service for our customers is at the heart of Virgin Money’s approach to banking, and we’re delighted to receive this recognition for the strides we are making, particularly as it’s voted for by customers themselves." Further down the table, HSBC (who also operate first direct), and its joint venture with M&S, M&S Bank, take the bottom two spots of our league table. 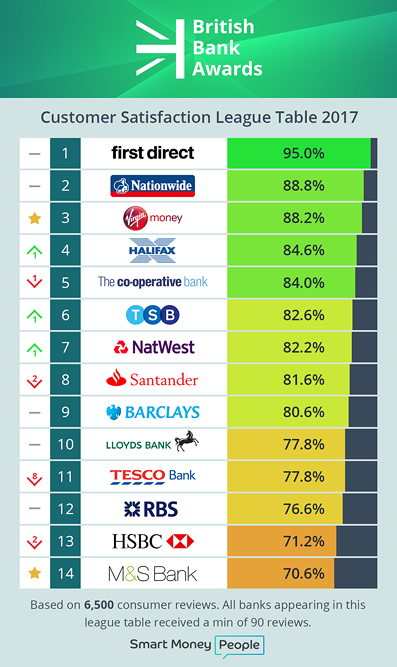 Also moving down the customer satisfaction league table are Santander, who (in)famously cut the interest rate on their popular 123 Current Account for a second time just a few weeks ago, and Tesco Bank, who performed well in the 2016 awards but drop eight places this year. Overall, customer satisfaction across banking has dropped from 82% to 80%, in a sign that more competition and a greater focus on innovation haven’t yet translated into happier customers. As part of the voting process, some 84% of customers told us that they now prefer banking online or via a mobile app, but poor functionality proves to be a significant source of frustration, with M&S Bank customer Mark Folwell asking: “has no-one told them we are in the 21st century?”. NatWest won “Best Banking App” - a new category for the 2017 awards reflecting that fact that consumers are increasingly turning to mobile to manage their banking. So will a raft of new challenger banks sweep up our awards next year? Or will first direct make it four years in a row as the nation’s favourite? Sign up to Smart Money People to receive our updates, or leave a review today and continue to help others find the best financial services. Smart Money People is the UK’s leading review and insight hub. Find out more about us by clicking here.